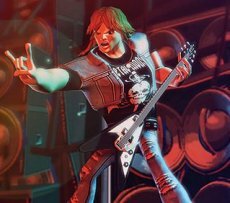 Guitar Hero III turned up a hefty revenue during the first week since its debut on the market, Activision announced. The statement came along with a wide grin, as the publisher’s expectations for the third quarter are ten times greater. The game was released on PlayStation 2, PlayStation 3, Xbox 360 and Nintendo Wii and generated over $100 million in the first seven days. The financial performance places it right on the second spot of the top. The pole position went to Microsoft’s Halo 3, which manage to break Guitar Hero III’s record o its first day. Master Chief is responsible for raking $170 million on the first day and $300 million throughout the first week. Activision’s revenue for the second quarter rose up to 317.7 million and the publisher’s expectations for the third quarter are overwhelmed with optimism. The company expects financial results to ring the gong at around $1 billion, with Guitar Hero III and Call of Duty 4 leading the fanfare. In the mean time, things aren’t going too well in the Neverending Sims and Sports Games Land. All that Electronic Arts had to report lately was a 195 million dollar loss during the quarter and the closing of the Chicago studio.